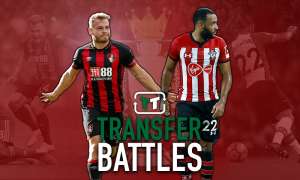 Bournemouth should swoop for this talented Manchester City star this summer | The Transfer Tavern | Where football transfer rumours fly or die! Bournemouth continue to defy the odds under manager Eddie Howe and once again put in a solid performance in the Premier League last season to avoid the drop. The Cherries have already stayed in the top flight for far longer than many expected, and the fans here in the Tavern are once again delighted to be seeing Howe’s men lining up once again in the Premier League. However, to maintain their place and keep beating the drop, the Cherries must continually improve, and that means signing new players who can improve the squad year on year. One player our landlord dropped into the conversation this week was Man City star and Celtic loanee Patrick Roberts, who has been excellent for the Bhoys over the course of the last two seasons, but does not look like breaking into the City first team any time soon. The impressive young attacking midfielder has been a key member of the Celtic squad once again this term, and despite only getting on the scoresheet just the once, his stock has continued to rise at Celtic Park. However, with City having such a depth of talent, Bournemouth could well look to make a move for the 21-year-old, where he will no doubt be given more first team chances and the opportunity to impress crowds in the Premier League. Cherries fans, what do you think? Good signing? Let us know in the comments!